The first indication that something is wrong in a model is often an unexpected result in the visualization pane. 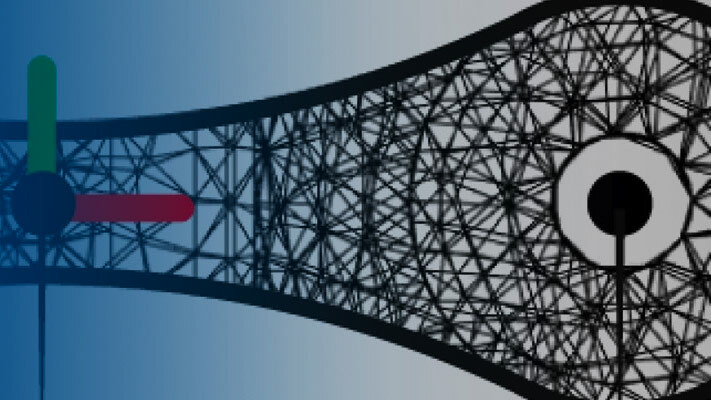 Unexpected results can include disparities in solid shape and size, incorrect translation and rotation transforms between solids, and even joints and constraints that fail to assemble. To help you troubleshoot such modeling issues, Mechanics Explorer enables you to go directly to a block associated with a node in the tree view pane. This feature helps you also to iterate on a model that is working properly, for example, if you want to replace a body subsystem with an alternative version. 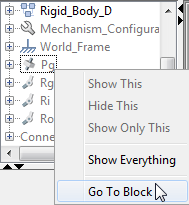 In the tree view pane of Mechanics Explorer, right-click the node whose block you want to examine. From the context-sensitive menu, select Go to Block. Simscape™ Multibody™ brings the block diagram to the front and highlights the block corresponding to the selected node. For an example showing how to troubleshoot a model using Mechanics Explorer block highlighting, see Troubleshoot an Assembly Error.